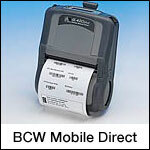 The BCW Mobile Direct is a bright white direct thermal paper label stock for printing high-contrast, black, visible light images in a wide range of temperature applications. A special acrylic-based all temperature adhesive allows application with standard corrugated, package labeling and even freezer grade materials. No ribbon required. Compatible with Zebra QL Series printers. 1.00" x 4.00" direct thermal paper label on a 0.75" x 2.25" core. 120 labels per roll / 36 rolls per case. Special features - Black Mark Sensing, Perforated. No ribbon required. 2.00" x 1.00" direct thermal paper label on a 0.75" x 2.25" core. 350 labels per roll / 36 rolls per case. Special features - Black Mark Sensing, Perforated. No ribbon required. 2.00" x 1.25" direct thermal paper label on a 0.75" x 2.25" core. 280 labels per roll / 36 rolls per case. Special features - Black Mark Sensing, Perforated. No ribbon required. 2.00" x 2.00" direct thermal paper label on a 0.75" x 2.25" core. 220 labels per roll / 36 rolls per case. Special features - Black Mark Sensing, Perforated. No ribbon required. 3.00" x 1.75" direct thermal paper label on a 0.75" x 2.25" core. 340 labels per roll / 36 rolls per case. Special features - Black Mark Sensing, Perforated. No ribbon required. 3.00" x 2.00" direct thermal paper label on a 0.75" x 2.2" OD core. 210 labels per roll / 36 rolls per case. Special features - Black Mark Sensing, Perforated. No ribbon required. 3.00" x 2.00" direct thermal paper label on a 0.75" x 2.60" OD core. 285 labels per roll / 36 rolls per case. Special features - Black Mark Sensing, Perforated. No ribbon required. 4.00" x 2.00" direct thermal paper label on a 0.75" x 2.25" core. 285 labels per roll / 36 rolls per case. Special features - Black Mark Sensing, Perforated. No ribbon required. 4.00" x 6.00" direct thermal paper label on a 0.75" x 2.25" core. 105 labels per roll / 36 rolls per case. Special features - Black Mark Sensing, Perforated. No ribbon required.